There are two outdoor pools, one for families and the other for adults only, along with a paddling pool for younger children and an indoor, heated pool with both sauna and jacuzzi. The resort also has a tennis court, games room, gymnasium, health spa and a selection of bars and restaurants both on site and within walking distance. 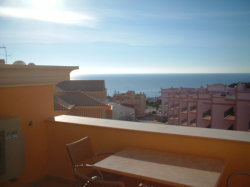 With the beach being only a few minutes walk away this is the ideal location for all types of holidays. Lounger with cable T.V., DVD player and a separate CD/radio. 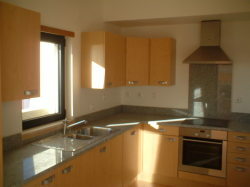 There is also a dining area forming part of this large room along with a separate well-equipped kitchen. 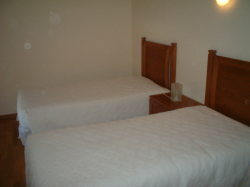 There are three bedrooms (one double and two twin rooms) and two bathrooms. 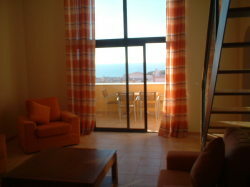 The apartment also has a double height window in the lounge area that leads to a balcony with magnificent sea views.